Himuro Kyosuke, a glorious name in JRock history. He was a member of BOOWY, along with Tomoyasu Hotei the great guitarist, the most popular JRock band ever. 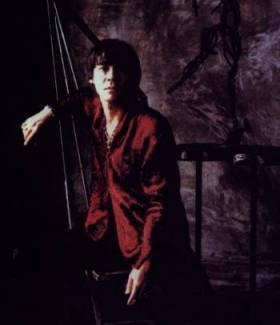 After the end of BOOWY in 1987, Himuro became solo singer and emerged out to be the best selling JRock male singer. All his albums were Oricon no.1 and all his singles were within top 5 of Oricon when released. After almost 2 years without new releases, he was back in late '99, but his recent singles are all ballads, in which the style is quite different from his old fast-rock songs. After the single "Girls Be Glamorous" released on 2001 new year, Himuro's work was merely in pause for almost 2 years. With his returning to TOSHIBA-EMI in 02.10 and the "BOOWY BOOM" started by the re-release of BOOWY's works at the end of 2001, is the dream of reuniting BOOWY coming true? After 7 years in Polydor, Himuro is now back with TOSHIBA-EMI starting from 02.10. New single is scheduled to release in this fall.